Warning: some mild swearing ahead. Couldn’t express my feelings for this one otherwise. Don’t get me wrong, I’ve read my share of crazy, weird and quirky stories and I actually enjoy reading them to take a break from the ‘ordinary’. But there is weird, and then there is I Am Behind You. My first thoughts when I started reading were literally: what the hell did I sign up for when I requested a copy?! Because there is one thing for sure, and that is that even after finishing it the only thing my mind is able to process is WTF WTF WTF did I just read?! I Am Behind You is actually a translation of a Swedish novel published back in 2014… I wonder if part of the story was lost in translation and made it more difficult to enjoy it, but considering the other reviews out there I’m quite certain this is not the case. The first thing that stands out to me is the plot, or actually the lack of a plot that actually makes sense. Like the characters, you are left in the middle of an empty field without a clue what is going on. Instead of adding suspense and intrigue, it only made me feel VERY frustrated and added to the overall struggle I had with this story. The worst part is that a lot of things are never explained at all and leave you empty handed and with that WTF feeling I mentioned before. The multiple POVs are also confusing and take a long time to get used to… The flashbacks are a nice touch, and I think I would have actually prefered seeing more of those instead of the current POV since the flashbacks at least made a bit more sense. I wasn’t a fan of the characters at all though. I disliked one even more than the other and this made it very hard to care about them or what would happen to them. And apart from the the lack of a proper plot, multiple POVs, unlikeable characters and the sheer absurdity of it all, I had a hard time connecting to the writing style as well. It might have been the translation, it might have been the writing, but it took me a lot longer than normal to reach the final page and to be honest it was a real struggle. And after such an unsatisfying ending, I kind of wish I could have DNFed this story instead. Because there is one thing for sure: this story 100% isn’t for me. I like weird, I like unconventional, but I Am Behind You was just batshit crazy. Guano style. When Molly wakes up early in the morning and asks her mother to go to the bathroom, something strange seems to be going on. Because the toilet block is no longer there. In fact, everything else has gone too and the only thing left are four campers in a neverending field of grass. Where are they? And why are they there in the first place? The four families will do whatever it takes to get back to the ‘normal’ world… But is that even possible? I was actually really looking forward to this book, but I guess I should have known after reading the blurb. The thing is: I normally like stories that are unconventional. Call me weird, but I find a dose of crazy to be rather refreshing every once in a while… But I wasn’t prepared for I Am Behind You. Because this story will definitely give you an overdose of crazy. The plot is basically absurd and doesn’t make sense and I was clueless even after reaching the final page. I didn’t manage to connect to the characters or writing style and overall unfortunately I had a really hard struggle with it. The fact that it took me about three times as much as normal to just finish it will say enough… Definitely not a story for me. I’ve had Can’t Buy Forever on my TBR for longer than intended, but the cover and promise of a 1950s setting kept calling to me and I finally picked it up a few days ago. I found myself looking forward to it despite the low rating, especially since I’ve been in the mood for historical fiction lately… But I ended up being far from impressed. Honestly, I don’t think I would have made it to the end if this wouldn’t have been an ARC; unfortunately it was a tough battle just making it to the last page. Part of the problem might have been me and others might enjoy this story better, but I will explain below why I ended up having to give Can’t Buy Forever such a low rating. 1. The supposedly 1950s setting is almost non existent except for a few mentions of a date or important event here and there. As a historical fiction fan I felt a bit disappointed by this, especially since the setting is especifically mentioned in the blurb. If you leave out those few time references, this story could have easily been set in the present as well… Such a shame, because a well developed historical setting would have added credibility and dept to the story. 2. I had a lot of problems with the main characters in general. I wasn’t able to connect to them and this made following the story a lot harder. Furthermore, Odessa acts a lot younger than the 18-year-old she is supposed to be… She cries all the time and her feelings for Nicholas are cheesy, not credible and it almost feels as if I were watching a ten-year-old having her first crush on a senior quarterback. 3. The crying. Seriously, how many times do Odessa and the other characters cry during this story?! Once it started to annoy me I just kept seeing those crocodile tears mentioned, and it really started to get on my nerves. It also made their feelings less credible and more cartoonish. 4. It has a love triangle. Or in fact various love triangles if I am more specific. And you all know now much I despise those… I can tolerate them if they are done right, but these examples were quite cringeworthy and the feelings just felt unnatural. 5. I don’t feel there really is a plot and the events themselves don’t really seem credible or make sense. I mean, Roark is supposed to get away with all he does?? And Odessa just accepts all what happens? And we as a reader just have to accept everything that happens as well without a proper explanation? The lack of plot or at least a proper idea of what is going on also made it a lot harder to follow; it just didn’t feel like a coherent story at all and almost like a delusional ramble of one of the main characters on their deathbed. 6. I wasn’t able to connect to the writing style at all. I don’t see the lack of grammar and mistakes mentiones in many reviews I saw on Goodreads, but the sentences don’t flow and it was really hard to keep track of the story and read more than a few pages at a time. The writing style was one of the reasons I considered a DNF various times during this story… And I’m still wondering if that would have been a better choice. Enough of the negative… There were some interesting aspects about this story, especifically Nicholas’ history and the gypsy references. I can’t go into details without revealing too much, but a focus on those and further development of those elements would probably have improved the story considerably. Without a proper explanation, the credibility of it all was simply lost. I really wanted to like this story, but as you might have guessed of this rather lenghty (for me) list, unfortunately I just couldn’t. Odessa Drake decides to change her destiny and moves in with her widowed great aunt Flo in Mineville, New York. Her aunt owns a boarding house and Dessa spends her days helping her out, working to keep the house running when she isn’t at school. Then Nicholas shows up and he is given the attic for lack of other space; four years later, he is one of the few boarders still in the house. They have grown fond of each other despite the fact that Dessa really doesn’t know a lot about Nicholas… But Nicholas has a reason to keep the past buried, and things might become dangerous when he gets too close. What secrets does he keep and how do they affect Dessa? I admit Aurabel was a coverlove-request, but I was also looking forward to read another mermaid story. Mermaids are without doubt underrated creatures and there just aren’t all that many stories about them out there. Aurabel sounded like an fun fantasy read with the mermaids as a bonus, but unfortunately this book turned out to be a quite unpleasant experience. First of all I want to make clear that this book should have been classified as a sequel, because after some investigation I found out most of the worldbuilding is taken from a previous publication (Lorali) and it’s almost impossible to fully understand Aurabel with out it. A lot of background AND essential information is missing if you don’t read Lorali, and I felt a bit cheated on I didn’t know that beforehand. This lack of information might have been part of the reason I basically felt like I was reading a story written in a foreign language I could only barely understand. Things just didn’t make sense as all and I had a hard time even getting past the first few pages and chapters. Things only got better towards the ending, but I have to be honest and say I probably wouldn’t have reached that point if this wouldn’t have been an ARC. It sounds harsh, but somehow not telling the truth doesn’t feel right either… Another thing that bothered me is the horrible spelling in the forum interactions bit. 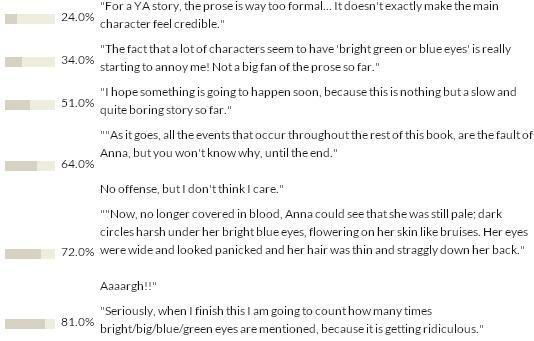 I get that this is supposed to portray ‘superficial’ teenage fans talking, but 1. it was really hard to decipher the meaning of their comments and 2. I literally shuddered the whole time every time the dreaded comments made their appearance. As for the characters: I like how their different personalities are refleccted in their respective dialogues and prose, but I do have to see they felt a bit forced and unnatural. Some characters were also starting to get on my nerves… Furthermore, I had a hard time connecting the different chapters and characters; especially in the beginning they seemed random and didn’t make a lot of sense. Things did improve slightly towards the ending and the general plot is interesting enough, but all in all I had a really hard time reading Aurabel. Such a shame, because I was really looking forward to it! It’s been two years since Rory drowned and Lorali has been living the live of a normal (human) teenage girl ever since. Her safe life on land won’t last much longer though, as things in The Whirl seem to be getting out of hand. Someone is trying to take the throne from the current king and doesn’t hesitate to use unorthodox methods to succeed. Even if that means hurting fellow Mer… And it seems that even Lorali won’t be safe. I really wanted to enjoy Aurabel and I still love the cover, but unfortunately I turned out having a completely different reading experience. I’ve debated various times whether to just DNF it, because I had a really hard time understanding and making sense of the story; something that doesn’t happen often. I’m not exaggerating when I say it felt like I was reading in a different language, but I guess part of this confusion can be explained by the fact that it’s necessary to read Lorali first to be able to fully understand the story (which I didn’t and won’t). All in all a promising premise, but unfortunately I couldn’t enjoy the execution. As part of the Beat The Backlist challenge I’ve joined this year, I’ve been browsing my kindle a lot lately. I stumbled upon The Light That Gets Lost just as I was looking for my next read, and I was intrigued by the the title and the cover. Confession: I didn’t check what the book was exactly about nor did I realize it had a very low goodreads rating, or I might have doubted my rash decision. Because I ended up being just as lost as the light in the title. Basically it’s a miracle I even made it to the end, because I had a REALLY hard time reading this story. First of all, I had a really strong dislike for the writing style. The dialogue overflows with ‘slang’ and bad grammar and instead of creating a ‘youthful’ vibe the only thing I felt was extremely annoyed. It’s also quite confusing what’s really going on with the main character, what on earth he is doing at the camp and how such camp even exists in the first place. Is The Light That Gets Lost actually set in an dystopian world? Is Trey just messed up or has he really a demon inside him? If I have to be honest, in the end I think I just really don’t care… Because instead of losing me halfway through, I think The Light That Gets Lost has never had me in the first place. When Trey is only a little boy, he witnesses something no child should ever see. Because as he is hidden in a cupboard, he hears his mother and father being killed brutally at home. And even though he is small, he makes a promise to himself he will get revenge one day. Years later, he might be able to come closer to that goal. Trey enters a strange camp meant for troubled teenagers. He has been in and out of trouble ever since he witnessed the murders, but he isn’t at the camp to be saved. Instead, he is sure he will find the man who killed his parents at the camp. Will he be able to do just so? The title and cover draw you right in and the blurb still sounds pretty good, but I can’t say I actually enjoyed reading this novel. The Light That Gets Lost has a writing style that either works for you, or will curl your toes as the ‘slang’ and bad grammar dialogues pile up. The story doesn’t really make a lot of sense and I’m still not exactly sure if this is supposed to be dystopian or just a really messed up ‘realistic’ fiction story… I’m sure the right person will probably enjoy this a lot better, but The Light That Gets Lost definitely wasn’t my cup of tea. I should have been warned sufficiently by the low Goodreads rating, but I thought this would be one of those unpopular opinion books. Why? Because unlike most book bloggers out there, I absolutely loved Jonas Jonasson‘s other novel The Hundred-Year-Old Man Who Climbed Out Of The Window And Disappeared and I was hoping of having a similar experience with this new book. I guess I was wrong. While The Hundred-Year-Old Man was interesting, fast-paced and laugh-out-loud hilarious, Hitman Anders And The Meaning Of It All was simply painful to read. In fact, I have been considering a DNF at various points in the story and decided to skim-read the last part because I just couldn’t take it any longer. Such a shame, because I really wanted to enjoy this book! Why is Hitman Anders nothing like his other novel? First of all: the story simply isn’t funny. Instead of laughing out loud, my eyebrows worked overtime as I became more and more annoyed by the plot and characters. Or should I say: lack of plot and character development. Seriously, the plot just doesn’t make any sense and the religious elements really started to get on my nerves. I mean, a former hitman finding Jesus and wanting to start his own church?! Sorry, that just isn’t doing it for me. I felt no connection whatsoever for the characters and the only reason I was able to finish this book is because I skim-read the last 40% of the book. As you might have guessed, I wouldn’t recommend this book. Make sure to try his other book The Hundred-Year-Old Man Who Climbed Out Of The Window And Disappeared though! Hitman Anders has been having a problem with drugs and alcohol most of his life, making him quite violent and earning him a few prison sentences. Now he is fresh out of prison yet again, he decides to stay away from the hard stuff so he won’t end up right back inside… And then he meets a receptionist at a 1-star hotel and a female Protestant vicar who happens to be an atheist. The three get together and put together a very unusual business plan that is supposed to make them all very rich. It seems to work for a while, until their most important asset of all of a sudden finds Jesus. With Anders no longer wanting to do his job and focussing his day on his new religion and drinking ‘the body of Jesus’, the receptionist and vicar will have to find a new way to get their money… And the new plan is even more ludicrous than the last one. Will they be able to succeed against all odds? I really wanted to enjoy Hitman Anders And The Meaning Of It All despite the negative feedback, but unfortunately I will have to agree with the mayority on this one. Unlike Jonas Jonasson‘s other novel, this one didn’t manage to impress me and I even thought about DNFing it at some points. Both the lack of character development, the uncredible/poor plot and the fact that this story isn’t funny at all unfortunately just made me feel really disappointed by this book in general. The Wizard finally gave the Tin Woodman a real heart, but he didn’t live happily ever after just like in the original story. In fact, the new heart of the Tin Woodman has it bad for Dorothy. What was onces a gift now turns into torture as the Tin Woodman pines for Dorothy and she doesn’t seem to return his feelings… And he is determined to do whatever it takes to show his loyalty, win over her heart and make her his. Even if this means ignoring the fact that Dorothy seems to have a completely different agenda since the last time she was in Oz. Like I said before, I enjoyed the the actual series a lot better than the prequel novellas, and Heart Of Tin has to be the worst one by far so far. This novella doesn’t add anything new to the main plot and is mostly VERY annoying. There is no real plot and the story is mainly about the Tin Woodman repeating on and on how wonderful Dorothy is, hearing him pine for Dorothy and him feeling rejected when Dorothy doesn’t seem to respond to his feelings. Even if you loved the main series, I would recommend just skipping this novella and continue with the fifth one.